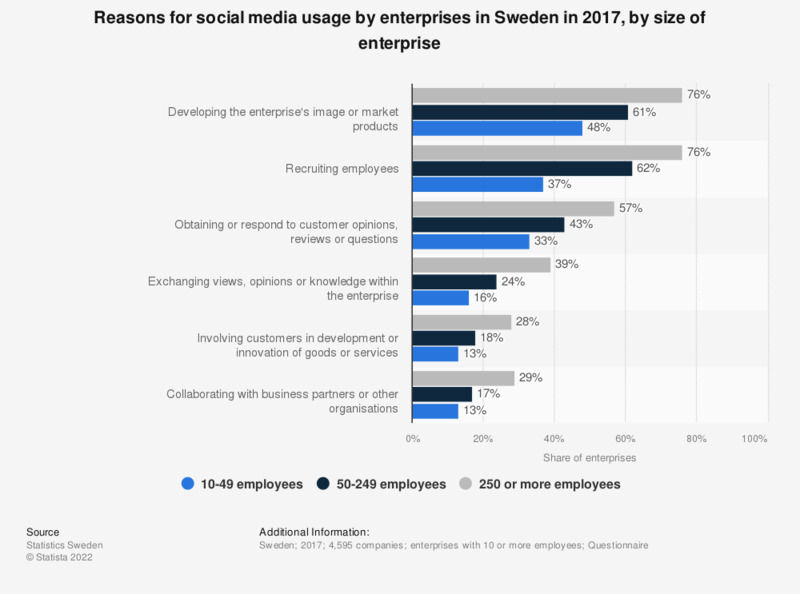 This statistic displays reasons for social media usage by enterprises in Sweden in 2015, by size of enterprise. There was a tendency for bigger companies (250 employees and more) to use social media in a greater extend than smaller companies. 60 percent of large companies have used social media to recruit employees, while 24 percent of small companies (10-49 employees) have used that. Everything On "Digital marketing in Sweden" in One Document: Edited and Divided into Handy Chapters. Including Detailed References. Statistics on "Digital marketing in Sweden"
Which of the following marketing tactics is your company using? Does your company use search engine optimization techniques to appear higher in the search results? Does your company use search engine optimization (SEO)? Does your company advertise on search engines such as Google and Bing? Does your company have a social media profile? Which social media platforms do you use for your marketing activities during this quarter? Did your company pay for advertising on Facebook? Does your company use direct mail, e-mail campaigns or telemarketing? Does your company use content marketing? How long experience do you have with influencer marketing?